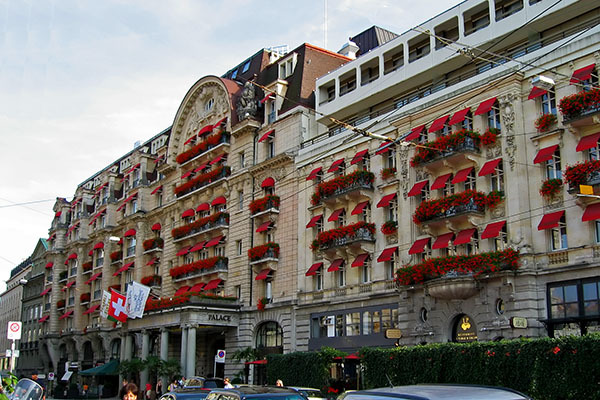 Ideally located in the heart of Lausanne, the Olympic Capital, in French speaking Switzerland, the Lausanne Palace & Spa enjoys a superb view across Lake Geneva to the Alps. The beauty of its surrounding landscape makes it an exceptional place of refinement. The recognition since 2007 by UNESCO of the Lavaux region, 10 km from the Lausanne Palace & Spa, now on the list of “Real World Heritages” serves as proof of its uniqueness. At the heart of Lausanne, the Lausanne Palace & Spa, offers to you its parking open 24/24 and 7/7, an ideal base from which to discover Lausanne and quickly and easily access the different services which the Lausanne Palace & Spa offers you. If you would like to book a room at Lausanne Palace and receive the discounted EPFL rate for the event, please mention “EcoCloud” whilst booking by phone. Please note that you cannot procure this rate by booking online.